Founded in 2003, Finexo has become one of the brightest and best EU regulated Forex brokers for both new traders and veterans alike. Thanks to a minimum deposit of just $25 on the mini account and rising to $5k on the VIP account there is something to suit you no matter what your experience or investment level. The feature that will appeal to many is the variety of deposit methods available. You can deposit in the most usual way of credit card or wire transfer, or you can take advantage of the PayPal, e-Bullion, Liberty Reserve or MoneyBookers options. 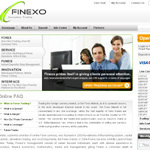 This payment flexibility compliments the fantastic ease of use the Finexo platform offers. It is labeled as one click trading and you will find it is very true to its word. Better still there are a massive 50 different currency pairs that you can choose from meaning you can really make money from a variety of markets. The platform is based online which means you can trade from any PC in the world providing you have an Internet connection. This means if you travel frequently or wish to trade while on vacation you can with Finexo. If you have a capable cell phone you can also trade via the mobile trading Finexo platform. The security on Finexo is top class meaning you can trade with confidence that your account will never be compromised. There is also a fantastic up-time record of the platform so you do not have to worry about missing a trade due to technical difficulties. On the mini account you can benefit from a leverage of 200:1 and 5 pip spreads for your $25 minimum deposit. For a $500 deposit you can open a classic account and receive a leverage of 200:1 and 3 pips, and if you have a big investment you can open a VIP account with a $5k deposit and receive 200:1 leverage and spreads of just 2 pips. Finexo offer a solid platform that is really easy to use even if you are new to Forex trading. With a great range of currency pairs to trade and some very competitive pip spreads and leverages it is a good choice for you no matter what experience you have of Forex trading.